Take 35 NORTH towards Denton. The SHORT CUT is a toll bridge, if you want to "aviod" the toll follow our directions from Denton. For the short cut you will EXIT off 35 on Swisher Road, "about" the second exit after you come across the Lewisville bridge on 35. Exit SWISHER ROAD and turn RIGHT onto Swisher. Go through 2 stop lights and then follow the road across the Lewisville toll bridge. After you cross the toll bridge the road with out warning is NOW CALLED Eldorado. The first STOP LIGHT after the toll bridge is 720.... 720 only turns left coming from that direction. Turn LEFT onto 720 and go "about" 4.5 miles further on 720. At the 2nd STOP LIGHT you will be at 380 also called Univeristy Drive. Turn RIGHT onto 380 and go to the NEXT STOP LIGHT. That is FM 2931 (our road) TURN LEFT onto FM 2931. There is Circle K Gas Station on that corner. The road only turns left. 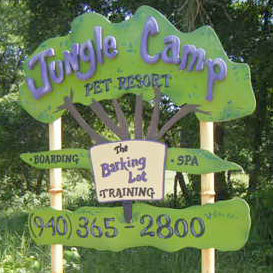 Sign that says Jungle Camp Pet Resort (it's set back off the road a bit). On your right there is a sign on a pole that has our house number, 2880. You will see our sheep in the pasture.